This study provides an overview of the situation of migrants from Eastern Partnership (EaP) countries in Germany, with this chapter particularly focusing on the labour market integration of EaP migrants, their access to social assistance and social services, and the impact of these flows on the German labour market. 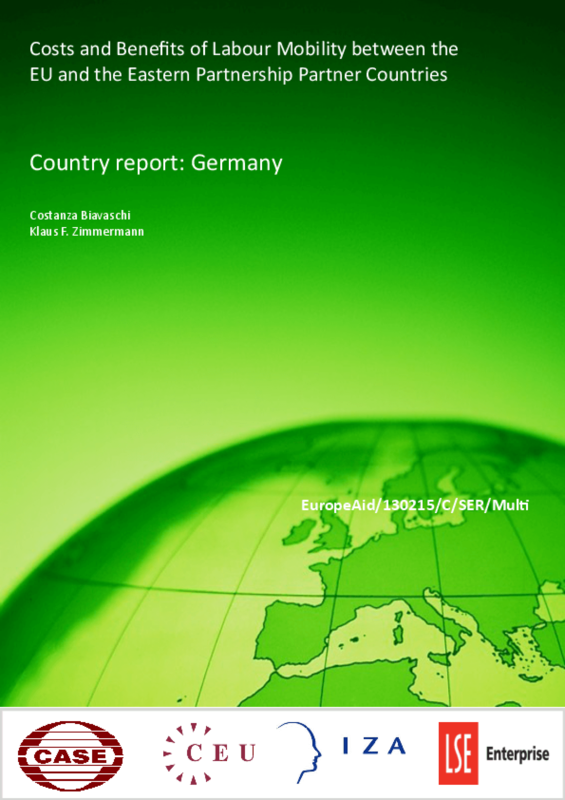 We then provide an informed view of the scope for future increased mobility between Germany and EaP countries, in the light of the skills needs and demographic trends expected in the next 10 to 20 years. Based on the results, the following conclusions can be drawn. More than half of EaP migrants come to Germany for work and study purposes. Family reunification is important for Ukrainians and Moldovans. Work and family purposes are the two main residence grounds for migrants from Moldova and Ukraine, while the other nationalities hold residence permits for reasons of study and work in most cases. Copyright 2013 Center for Social and Economic Research, Central European University CEU, Institute for the Study of Labor, LSE Enterprise.